Meet Evan Gabriel. He’s your lovable military flunky. Does the right thing, saves his men, gets knifed in the back by political nepotism. You want the truth! You can’t handle the truth! Anyway, in this little gem of a book, Gabriel is reactivated for duty after a dishonorable discharge during the latter half of the 22nd century. The assignment is to stop a designer drug called Dew from overwhelming the military and the human race at large. The twist is that it comes from off planet, a long way off planet. 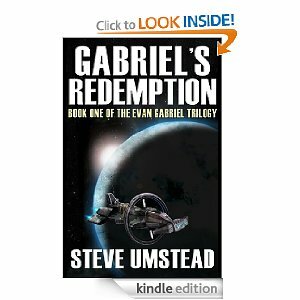 That should be all you need to get you revved up and ready for reading Gabriel’s Redemption, a well conceived and executed science fiction, military thriller. 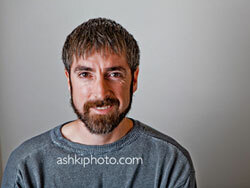 The tech is thought out and sprinkled throughout the opening at a smooth pace, as is Gabriel’s character. Overall, Umstead offers us a shining example of why independent authors are here to stay. Oh, and the other two in the trilogy are available as well. Read it! Review it! Share it! Now let me introduce you to Neville Lansdowne, the protagonist of an unusually fun, satirical little story along the lines of The Little Prince by Antoine de Saint-Exupéry. If you didn’t know, let me tell you. The Little Prince is one of my all-time favorite books (one of my must-read-before-the-age-of-eighteen-or-risk-being-a-screw-up books). 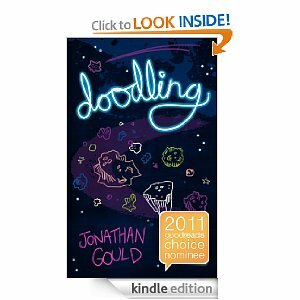 But this little review is about, Doodling, not that other classic. Jonathan Gould doesn’t quite pack the same amount of life wisdom in his short, satirical gem, but he comes close. After Neville lets go of the earth he meets an assortment of individuals who have all done exactly the same thing. Soon it becomes apparent what his new aim in life should be, and the reader will enjoy tagging along to see how it all turns out. Amusing and insightful for all ages, Doodling shouts for one and all to Read it! Review it! Share it! Howdy, gentle partners. This week’s Read it! Review it! Share it! Goes West with a bit of weird. But first a West that’s just quirky. Ah, the wilds of Arizona during the latter half of the nineteenth century. Where else would you rather be? 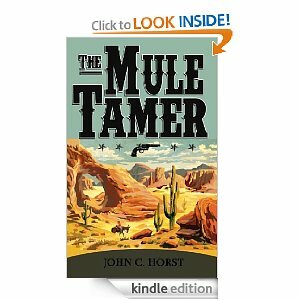 The Mule Tamer builds off of a strong and quirky protagonist who is simply fun to read about. The Arizona/Mex flavor of this book strikes a bold note like fresh pico de gallo on a summer day. Alas, at times the prose of this book can be a bit tricky to navigate, bordering on convoluted. But if you enjoy a good posse every now and then, The Mule Tamer has what you’re looking for. If the first two pages make sense to you (try the ebook free sample first), then sit back and Read it! Review it! Share it! Here’s a new twist on an old genre. 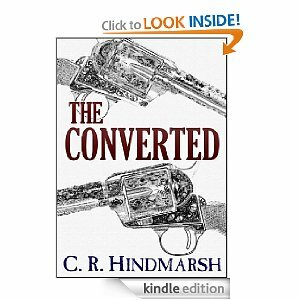 The Converted is a Western, no two ways about it. But it’s set on a second world (a world a lot like ours, but not ours–like Gotham or Hogwarts). A variety of strange peoples, including gray, barbarous mountain men, mix it up in a story that is Western at heart. People have decorated their faces with tats and their horses with genetic alterations, but they still carry six shooters and shotguns. Overall, it’s an intriguing book, but the execution gets a little shaky in spots. 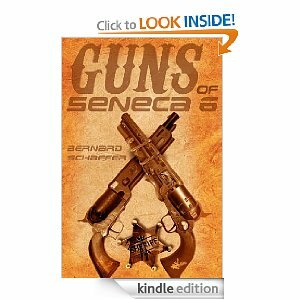 If you like Westerns and enjoy a little deviation from the norm (like a certain blog writer I know), then Read it! Review it! and Share it! This is a romping fun read. Full disclosure requires I tell you up front, I love a good space western. But who doesn’t? This is a good space western. From the opening sentence the reader knows exactly what sort of book he/she is reading: a rooting-tooting, border-town Western built around a touching father/son relationship. The only twist is that Seneca 6 is a mining planet orbiting a different sun. The story is well-written and hits all the main targets of the Western genre, including it’s own version of savages. Throw in a bit of a coming of age story, and you’re in for a good read. Of these three, this one was my personal favorite. Read it! Review it! Share it! Not an indie writer, but still a quality read! I happened on this book through a blog and wanted to check it out due to its near future, sci-fiction/thriller combination (witch is the same combo I’m working on for my next novel, after Twitch and Die! Rising delivers what it advertises. The opening is tightly paced with tid-bits on how the near future has played out, little bits of new tech (but mostly new uses for old-tech), some character development and lots of mortal danger. Good combo. Plus, patrolling the melting Northwest Passage for nuclear waste dumpers provides an excellent reuse of an old, rusty airship. (Who says airships are only for steampunk?) 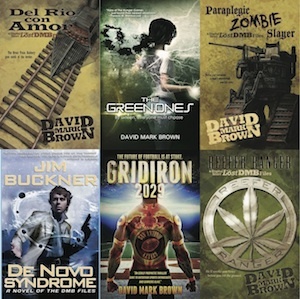 Frigid cold waters, bad guys, environmental choas… what more could a redneck granola like me ask for? 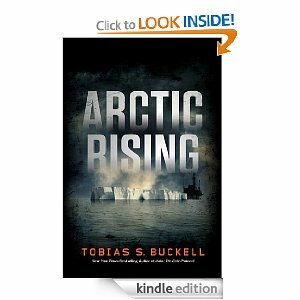 *Warning: due to the non-indie status of this novel, the ebook is $12.00! That hurts! but if you can afford it, Read it! Review it! Share it! This book has a cool gimmick. This book is more than a cool gimmick. This author duo has piloted the most successful version of serial fiction I’ve seen since the Green Mile. 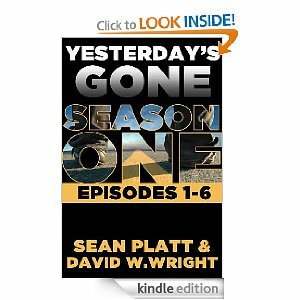 The story is divided up into 100 page “episodes” with around 7 of these to a “season.” They are done with season two now. The success of the series (for my money) is based mostly on the cool and eerie plot concept. In a flash, most of the Earth’s population disappears. The people who are left, struggle to figure out what the freak happened. Do to the 100 page episode format the writers have a chance for a crazy, mind blowing ending every 100 pages. Both the plot and the format combine to create page-turning, pulse-pounding evenings of reading. Consider Yesterday’s gone your Netflix replacement for the next few weeks, and enjoy. *Tip: buy these episodes as “season one” and “season two” for best economy. Read it! Review it! Share it!